Thanks for the comments, Kostia! Stay tuned cuz there's lots more on the way. I'm pretty sure thats the mall in Mallrats if your interested. The mall in Mallrats was the Eden Prairie mall. 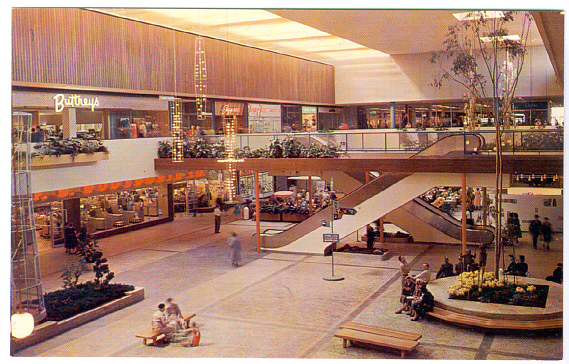 The Southdale Mall in Edina however, was the first mall in the world. For Minnesota, Southdale has some serious competition (MOA is a few miles up 494; Galleria across the street) yet it is still always really busy and appears to be profitable. They added on a movie theater, PF Changs, Cheesecake Factory, and a Mini Cooper dealership that is supposedly the #1 in the country. God forbid Marshall Fields aka Dayton's shuts down. Minnesotans know how to shop. I used to hang out at Soutdale in the late 70's. It looked just like that. It was the first enclosed shopping mall in the country. It is heated and cooled using geothermal energy. Thanks for posting this, I live near this mall and always am keen on seeing historical pictures. that is really interesting that southdale was the first mall..haha..i live in eden prairie, and yeah mall rats was taped at our mall back in the mid 1990s..i actually got to see the set and stuff, but the mall looks nothing like it did in the movie. they revamped it (was much needed) and now is an awesome mall. This mall had to have been the inspiration for the game Mall Madness. I live and work near Southdale as well (actually, I work closer to Eden Prairie Center--possibly the prettiest yet most worthless mall I've enountered). Another tidbit of malls in the Twin City metro area is that many end in "-dale." There's Rosedale, Brookdale (I think, or something like that), and Ridgdale at least. Not sure what that means though. Southdale is called Southdale because Edina is very near south Minneapolis. My mom told a story of going to Southdale when it first opened. She got a sandwhich with her boyfriend at the food court and found a huge bug in the lettuce. FYI, I will cover the whole MALL RATS thing a bit at some point, fear not (it's come up a lot). I will be sharing more Southdale stuff soon. "Bugette, maybe you'd agree that our blogger here should include photos of the Mall Madness game. Love it! :)"
When I was 16 and had my first drivers license, my mother insisted I drive her to Southdale Mall. We lived in the north edge of St Paul, about a 20 mile drive. My father who drove truck wrote down the directions on paper with little maps where to turn etc. This was my first big excursion outside of our part of the city and a real big deal for my mom. Thought the mall idea was great, with being cold in the winter one could shop in comfort and no snow! Southdale was planned by the father of the shopping mall, Victor Gruen, in 1953 and is considered the original shopping mall prototype. Southdale was the first fully enclosed, two-story shopping mall containing more than one major department store. Southdale's success challenged the prevalent belief that two competitive department stores in a development were bad for business and that people were too lazy to walk away from their cars, much less climb stairs to shop on a second level. Most of the early malls that evolved from the strip mall are located in the Mid West; Minnesota's extreme weather means few outdoor shopping days, and the concept of the indoor mall rose to allow people to shop in comfort year round. Thanks for the very insightful background, Frede! Your Mall thesis writings in your link are fantastic! Pleasure to have you here. MOVED INTO SOUTHDALE AREA AFTER MILATARY SERVICE IN 1955, BEFORE SOUTHDALE. LOTS OF HOMES WHERE BEING TORN DOWN TO MAKE HWY. 62, & FAIRVIEW HOSP TOO. WHEN "SOUTHDALE" OPENED IT WAS 1/2 EMPTY, THERE WAS "FENCE" & THRIFT. NEXT TO "RED OWL" DON DELARIA HAD KFC DELI & BOUGHT US "BOOZE" AT VILLAGE LIQUOR. NO ONE KNEW WHAT "MALL" WAS, SO IT WAS EVERYTHING. ONCE FIRST NATIONAL BANK HAD SO MANY DEPOSITS, MONEY WAS SCATTERED AROUND DEPOSIT MACHINE ON GROUND.SIGNED:PHYSICIAN THOMAS STEWART VON DRASHEK M.D. Does anyone remember the Picadilly circus (?) Not sure if that is the correct name in the basement at Southdale? They had tigers and kiddy rides. My sister and I used to go there when we were small. It was so much fun!!!! Yes, it was Picadilly Circus. On a similar note from that era, anyone remember "Roz"? It was a magic/novelty/rubber mask/costume shop in the basement in the 70's - early 80's? I was terrified of the scary masks in the window when I was a little kid going by. Later on I bought my first "professional" magic tricks there! I also remember that place which we remember as Picadilly Circus. I can't remember when it closed but it must've been sometime around the time when they remodeled the whole mall. But i liked that place back in the 70's-80's. Is my memory that good that i remember it seemed to have a semi-circle entrance to it. Do they even still have a basement at Southdale? My sis and I used to ride our bikes from Richfield to Southdale Mall in the "sixties". We'd park our bikes, no locks needed and spend an afternoon inside hanging out by the birdcages and/or shop if we had babysitting money. I think it was the gariffe or elephant parking lot where we left our bikes, but the last store we stop by was Fannie Farmer candy store. I'd buy a couple of butterscotch canes and maybe some chocolate mint fudge candies. --These days I google map the route and roads to the mall from our house and recall those summer days and think to how dangerous that would be today for a kid. I'm trying to remember the name of a restaurant that I used to eat at in the mall as a little kid. It was a "family restaurant" on the first floor, and I don't remember much besides the walls having a horrible green and white striped pattern. Does this sound familiar to anyone out there who was not six when they went out of business? I'm thinking that this was sometime in the mid- to late-eighties. Any help would be appreciated. Roz in the basement of Southdale was fantastic! I think about it alot, as was Picadilly Circus the video game arcade. The restaurant that someone mentioned with the green and white was called the Raintree family restaurant and it used to have rain falling on strings (much like a rain oil-lamp) and it had pumped in thunder sounds and lightning flashes and it was set up as if you were dining on a garden veranda during a rainstorm. There was also a restaurant out in the middle there by those giant birdcages and two-story high cast iron trees. I grew up in Richfield and Southdale was my home in the 70s and 80s!! Fantastic memories of America's first indoor mall. Thanks for the insight on the previous restaurant. I'm pretty sure that the place I was thinking of was just a plain old Arby's. Maybe they took over the space occupied by Raintree, but it's definitely a different place. I also didn't know that picadilly circus existed in southdale in the 1980s. What a trip. My only experience with the place is as a new business in Cen Lakes circa 1998. Odd. I remember "ROZ". My mom and dad couldn't ever get me out of the shop. I and a friend of mine did magic when we where kids, (matter of fact, I still have magic tricks I bought from Roz) we would take all our mowing lawn money at go to Eagle Magic then to Roz. If you remember in the window, a oversized tophat that had a floating fountain with water running into it..I bought it. Yes, fond memories.